Support smartphone or tablet with Android 4.4 and above, IOS 7.0 and above os(iphone 4s, 5, 5s, 6, 6 plus, 6s, 6s plus and iPad series), download free Apps “Zeroner” from Apple Store or Google Play. Does Not Support PC. * 1. The screen will auto light up and display time when you turn over hand(not shake hand), it remains black when there’s no activity. * 2. Touch screen control: click to confirm, slide to enter next icon, please refer to user manual. * 3. Enable message notification(facebook, twitter, skype) on “zeroner”, the watch will vibrate and display caller ID or message content(32 characters per line, click to display the left). Note: iPhone will display both ID and message content, Andriod will display either. * 4. 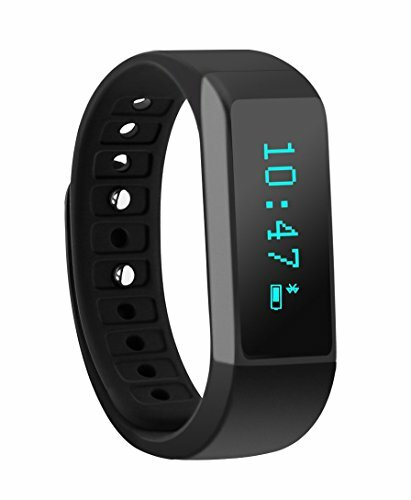 It tracks your steps, walking distance, calorie burnt, monitor sleep quality. Vibrating alarm can be used to remind of getting up, drinking water or sitting too long.